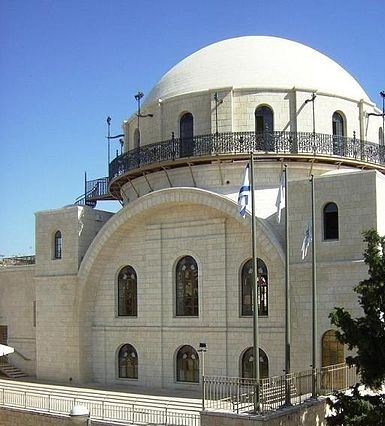 For 100 years, the dome of the Churva synagogue in Jerusalem's Old City prominently shared the skyscape with the domes of the al Aqsa Mosque and the Dome of the Rock. Note the enlargement from the 150-year-old title page photo above. In 1700, Rabbi Yehuda HaHasid acquired land called "the Ashkenzi compound" in the Old City for an Ashkenazi synagogue and institutions. Part of the funds for the purchase were borrowed from local Arab sources. When the rabbi died soon thereafter, the Jews were unable to repay the debt. 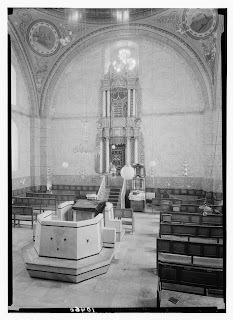 The Ashkenazi community fled, and the synagogue was destroyed by the Arabs in 1721. The site became known as "Churvat Rabbi Yehuda" -- Rabbi Yehuda's ruins. For 100 years Ashkenazi Jews avoided the Old City, only entering disguised in Sephardi garb. In 1811 -- almost exactly 200 years ago -- a man arrived in the Land of Israel, and he changed the landscape and humanscape of Jerusalem and Eretz Yisrael to this day. Avraham Shlomo Zalman HaTzoref, born in Lithuania and a student of the "Gaon of Vilna," moved to Jerusalem where he was determined to reverse the fortunes of the Jews of Jerusalem. He traveled to Europe to raise funds for the community, and in 1836 lobbied the ruler of Egypt and Palestine, Muhammad Ali Pasha, to cancel the Jewish community's century-old debt and to permit new Jewish construction. 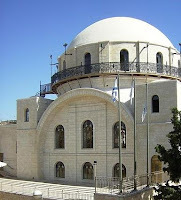 Local Arabs were angered by the cancellation of the debt and the restored Jewish life in the Old City, and they attempted to assassinate HaTzoref. In 1851 he was hit in the head in a sword attack and died months later, almost exactly 160 years ago. HaTzoref is listed in the modern annals of Israel's history as the first victim of Arab terrorism. His son Mordechai and grandson Yoel Moshe took on the family name of "Solomon." They were pioneers in establishing Jewish communities outside of the Old City such as Meah Sha'arim and Petah Tikva. Yoel Moshe established the first Hebrew printing press and newspaper in the Holy Land in 1863. 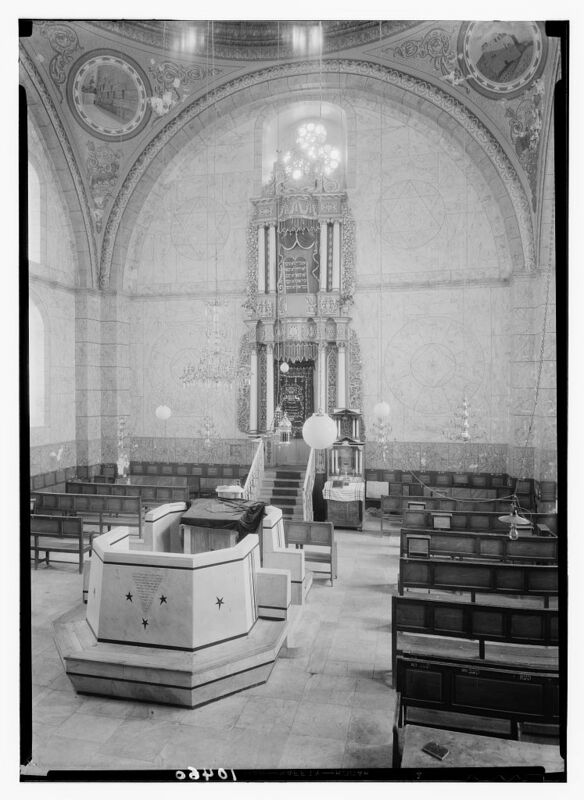 The Churva Synagogue was completed in 1864 and was considered the most beautiful synagogue in Eretz Yisrael. 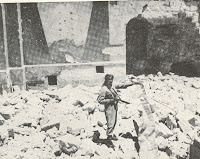 During the 1948 war, it was the epicenter of the fighting between the Jewish Haganah forces and the Jordanian Legion in the Old City. The Churva was captured and blown up. 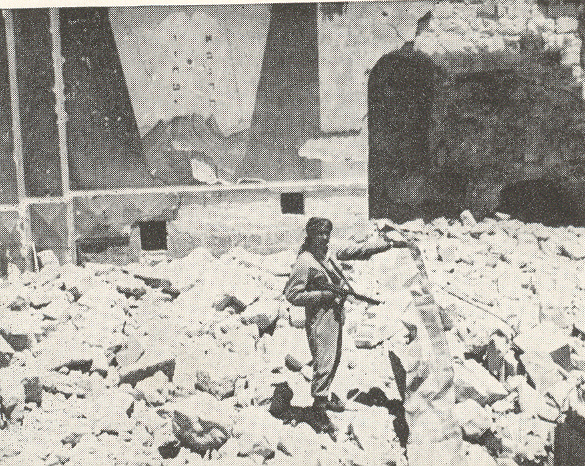 Israel recaptured the Old City in 1967. The Churva, with all its previous splendor, was rebuilt and rededicated in March 2010. View Part One of the ancient synagogue series. View Part Two here.